2015 Cars on display around town. Last year, I came across Jay Leno’s Garage 2014 youtube video on his participation in Italy’s yearly Mille Miglia vintage car race. First of all, Jay Leno has a great sense of humor, we know he loves cars and then put him in Italy and you want to join the fun! So, this year, I came to Brescia, May 14-17, 2015 where the Mille Miglia race starts. There are approximately 430 vintage car owners from around the world who gather here every year to enter the race. It’s a spectacular event to behold. Just look at the cars I am seeing. Really beautiful! Photographers and journalists are everywhere. The road race starts in Brescia goes to Rome and then back to Brescia. You can view a map of the race. It’s a tough race, especially for those coming from abroad who are not familiar with the small and winding roads of Italy. Normally, an Italian wins the race, but maybe a foreigner will surprise us this year. Wednesday the Italian Military had an Air Show, similar to our Blue Angles Air Show in the U.S., in honor of the Mille Miglia. Many of the vintage cars were on display at the air field. There were about 7,000 people viewing the show. Around Brescia, the media was setting up, cars were being driven in to be put on display, people were at cafes, walking, taking picture – having fun! If you are ever in Italy on vacation at this time, you will enjoy seeing the race. Whether you are in Brescia for the start or end of the race OR you see the cars driving through one of the towns, you’ll share in the excitement for sure! Wow this must have been so cool! I have never been to Brescia though, heard its a great little town. Yes, you would enjoy visiting Bresica. Next to Bresica is Milan, Verona, Venice, Padua and more. I would highly recommend going to see the Mille Miglia car race. 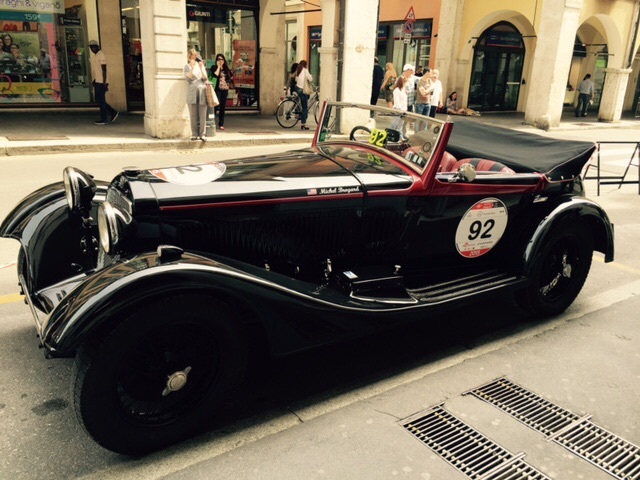 The town is full of the beautiful old cars for display before they start the race to Rome and then back to Brescia.